On a whim I bought one of these little boxes. For less then 20 bucks I figured what the heck! 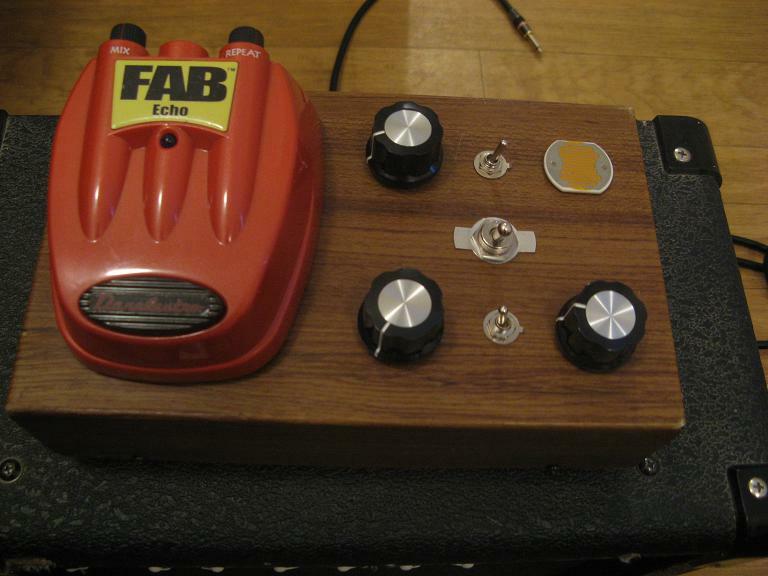 Did a little searching on Aron’s DIY Stompbox Forum, and found out that the Fab Echo uses a common chip to full on delay pedals. After checking over a couple schematics I (with the help of some forum members) found out how to un-lock the Fab Echo’s delay potential. I have the ability to add a Delay “Rate” knob (speed of repeats), increase the mix knob to full wetness, and to give it full feedback (which literally makes it feedback). On top of these controls I’ve also added LFO’s to the delay circuit that cause strange swirly sounds, and pitch bending weirdness. I mount the Fab Echo on to a larger box (in most cases) to make room for the added controls (there is no room inside these things. I set the LFO up to be powered by the 9v battery, or a pedal power supply. I’ve been charging 140. for the full setup (with LFO), and would of course charge less for a simplier one. For those that want to take on the basic mods themselves here is a link from the DIYstompboxes forum to the best documention of it I’ve found thus far. 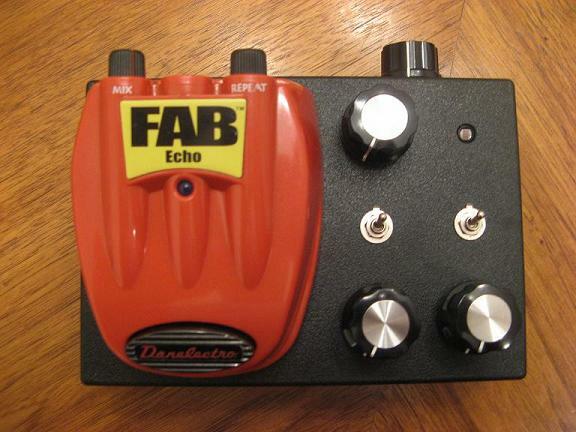 This is the first modified Danelectro “Fab Echo” pedal that I built. I made it so that that it now has a controllable delay time (from short to very long), and also made it so that you can control the delay time with the large knob or light senor. 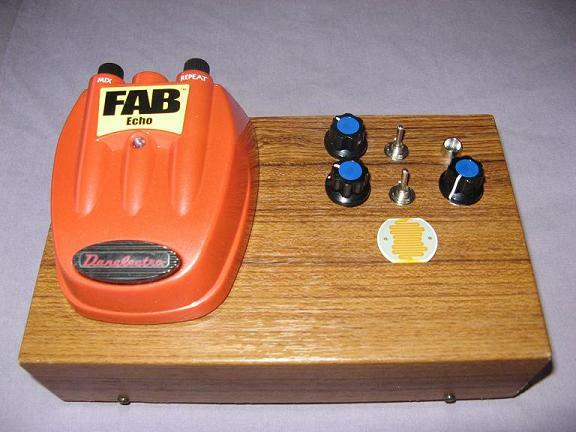 I also made it so that the pedal can feedback when the repeat knob is turned all the way up. There’s an added jack for expression pedal control of the delay time. This one has been sold. 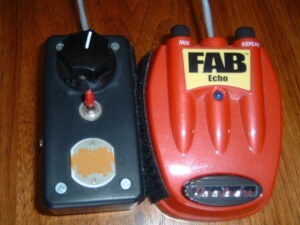 This is the second Fab Echo that I’ve modified. This one has the LFO feature built into it with with rate indicating LED, Rate control knob, and LFO on/off besides the usual mods. I will definitely take custom orders for these now that I have a good method for modifying them. This Fab Echo has sold. This version has all the mods above, plus the Osc. can go between triangle and squarewaves. This Fab Echo has been sold. 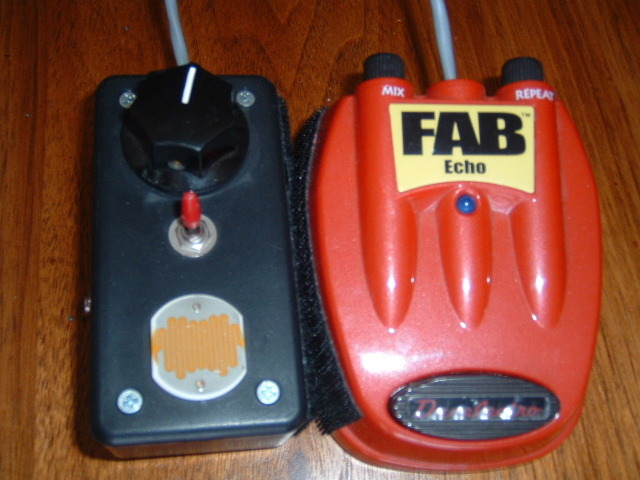 This Fab Echo has all the earlier mentioned mods, plus it has some modifications to the LFO circuit. This one has the ability to have square or triangle shaped waves controlled by a pot to get the in-betweens, and there is a Depth knob that really opens up the versatility of the LFO feature. This Fab Echo has been sold.